This book is about true purpose of life, about self development, unconditional love, emotional balance, positive thinking, about understanding of life lessons. The goal of this book is to help reader to be more successful in life and accomplish those tasks for which he/she comes in this world. 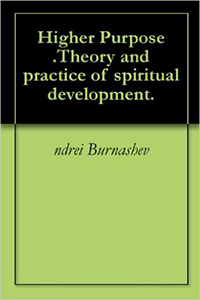 Book has two parts, firtst more like a theory, giving information about man, consciousness, lows of life etc, the second part offer practical skills such as concentration, awareness, meditation, methods to work wlth emotions and mind, methods which helps to overcome crises and preserve emotional balance. These methods and skills will be useful for many years. Book is tells about importance of balance and harmony, sense of proportion and common sense. This book has a greate value because it's about life purpose, because it's clear, practical and small; all this can save a lot of time and energy! Get more clarity on what you are here to do and to accomplish. *Self-development. * Self –realization. * Unfoldment of full potential. * Clarity on all subjects. Free yourself from negative emotions and live in balance and harmony! Three major objectives of education. Parents and children-right relationship. Listen to positive energy music that takes away your stress and tiredness and creates atmosphere of love, joy and happiness.